So, a while back I mentioned that I have this weird habit of getting super obsessed with a pattern and needing to knit it right. now. Anne Hanson’s Sign of Four was another one of those patterns. 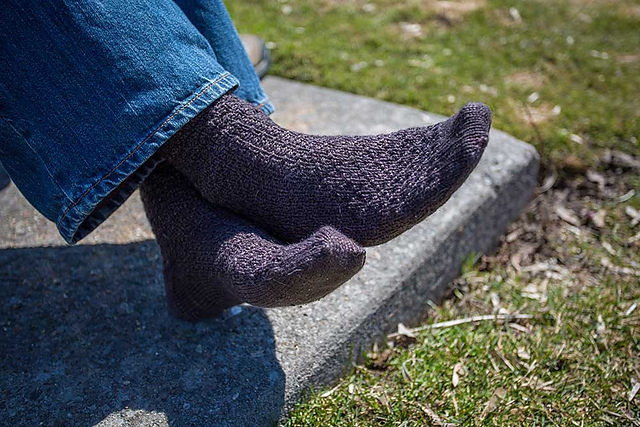 Someone posted a finished object shot of a pair of these on a forum I am part of on Ravelry and it was love at first sight. I had planned a pair of Anne’s Long John Socks for my dad, on her recommendation, but as soon as I saw these I was sunk. I had given Dad a pair of Anne’s Waffle Creams in blue for Christmas and he loved them so much, Mom told me each time they got out of the laundry, he had them on again the minute he could get his hands on them. Since he had requested brown socks (OMG, more brown socks!) I cast on. After all…there is really no better compliment, is there? As I was knitting I was struck by the fact that the texture was definitely more puffy and “popcorn-ish” than the photos, an effect I was less than pleased with, but I soldiered on, figuring that once they were on his feet, it would not matter. It was an easily memorize-able pattern so it made for great travel knitting. The first sock went off perfectly, so on the needles went the second, and everything went swimmingly…until I picked up my gusset stitches and went to knit the first stitch of the instep. And it was not the right stitch. The entire pattern had somehow gone one stitch off. One of the stitches has to move at the end of the leg, before the heel flap, and I am guessing in retrospect that I somehow managed to move the wrong one. I decided that, since I was on a bit of a deadline because they were coming to visit…I’d keep going. After all, it’s just texture! Plus, I knew I was the only person in the world who would ever notice (ok, maybe Anne herself might see the mistake!). Far as I can tell, no one else noticed. Once they were done, I soaked them and rolled them in a towel to squeeze the water out, before laying them out to dry. As I placed them on the windowsill, I noticed something wonderful…the puffier texture I hadn’t loved was gone and the pattern I had loved in the FO shots had emerged. I could not have been more thrilled! 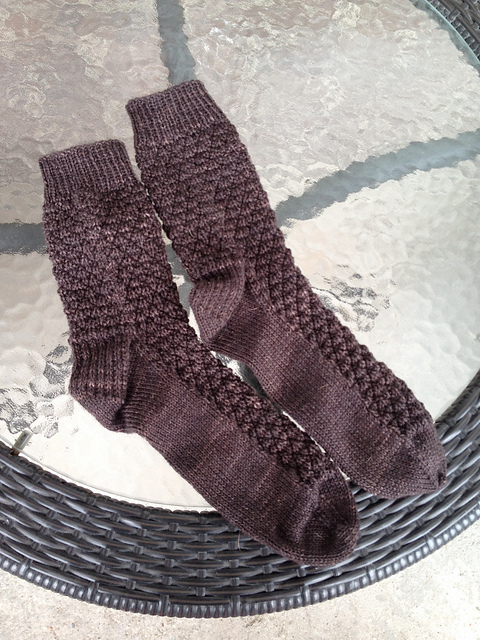 Dad loves these, too…and I will be knitting them again soon. He’ll still get his Long John Socks…those are next! Were There Changes Made To The Pattern? Only in the sense that I made a slew of mistakes that luckily no one will notice. Did I Learn Anything New? Yes…that I should check the pattern of the stitches on reserve for the instep before I start knitting the heel flap to make sure the configuration of the remaining stitches is correct. Would I Make Another? : I already have it queued, for me this time, with a second skein of Tough Love Sock in a gorgeous blue green colourway called Deep Cove. This entry was posted in Uncategorized and tagged anne hanson, dad, fo, knitspot, knitting, sign of four, socks, sweet georgia, tough love sock by Rayna. Bookmark the permalink.